The following is a list of the most common questions concerning both our undergraduate and graduate degrees. How do I schedule an appointment with an ISE advisor? Students should seek help from ISE advisors via e-mail ktreyno2@ncsu.edu or jclow@ncsu.edu. Many advising questions can be handled quickly via e-mail. If an in-person advising appointment is absolutely necessary, students can sign up for an advising appointment using Google calendars. To schedule an advising appointment, go to our Advising Page. Where do I get a copy of the 4 Year Curriculum Plan? Do students have to take E 102? YES, it is required starting with the freshman class entering in the Fall of 2017 and each cohort moving forward. What happens if students have a conflict with MA 303 – Linear Analysis? The student should consider taking MA 341 – Differential Equations. It is not the preferred option as MA 303 better prepares students for ISE 361 and ISE 362, but it is feasible and acceptable. What happens if students have a conflict with EC 205 – Fundamentals of Economics? Students should consider taking EC 201 – Principles of Microeconomics or ARE 201 – Agricultural Economics if EC 205 is not available. What happens if students get into one part of a paired course? ISE 215/216 and ISE 315/316 are paired courses using the other as a co-requisite and should be taken in tandem. If students have credit for ISE 215 after taking GC 120 then they should consult with their advisor or the Director of Undergraduate Programs for further assistance. What happens if students take ST 370 instead of ST 371? Students should always follow the course sequence as listed in the degree audit. They can take ST 312 which has been recommended by the Statistics Department as the follow-up course for ST 370. They will receive credit for the pair in lieu of ST 371 and 372, but they will not be as prepared for some ISE courses that utilize statistical methods including ISE 443 (Quality Design & Control) or the ISE 4/589 (Special Topics in Data Analytics for IE’s). They can request an override into ST 372 with the understanding that they are responsible for learning any and all content associated with ST 371 that is not covered in ST 370. In particular, ST 371 is almost entirely probability, whereas ST 370 is almost all statistical methods. ST 372 depends heavily on the probability material so students taking the courses out of sequence will be at a disadvantage. What should students do who want to enroll in a course that is currently closed AND does not have space available on the waitlist? Students should fill out the course request form indicating why it is imperative that they be enrolled in the course and what the alternative options are based on the classes left to complete toward degree progress. The form should then be sent to the Director of Undergraduate Programs for disposition. How do students participate in ISE 495 – Project Work in Industrial Engineering? The student should not attempt to enroll in ISE 495 without a faculty sponsor. Once they secure a sponsor and the deliverables for the project have been outlined, they need to turn the appropriate form into the Director – Undergraduate Programs for approval. How do students know which technical electives to take? The Approved ISE Technical Electives web page has a list of both the permanent and rotating technical electives (by semester). Please note that students should NOT take MA 405 as a technical elective as it is no longer allowed by the department. Also, keep in mind that not all ISE 589 Special Topics Courses count as technical electives either. Again, consult the technical electives web page for the most recent updates. Which Engineering Science Elective should students take? Are there any other options to satisfy the CE 214 requirement? How do you find courses that are pre-approved for transfer credit? Why do students have to take classes in other departments? CE 214 is a requirement for some of the other electives and should be taken as early as possible in the student’s academic career. In addition, course like ECE 331, MSE 200 and the engineering science elective are to provide a well-rounded understanding of other engineering disciplines as well as the ability to conform to ABET requirements. How do students declare their intention to participate in the ABM Program? Details of the program are on the Accelerated Bachelor/Master (ABM) webpage. The ABM degree has several milestones. Students cannot apply until they accrue 75 credit hours but no more than 96 credit hours. Students must have a 3.5 GPA and fill out the appropriate form for signatures by both the department’s Directors of Undergraduate and Graduate Studies. Why can’t ISE 520 “double count” for the ABM program? ISE 520 has no 1:1 replacement in the undergraduate curriculum. It can count as a “graduate course” (students are allowed 6 hours of “graduate courses”), but it cannot be listed as an undergrad course that is taken for ABM credit due to ABET requirements. How do students declare their intention to participate in the Health Systems Engineering Certificate Program (HSECP)? The details of the HSECP are on the Health Systems Engineering Certificate Program web page. Students must have junior classification, a 3.3 GPA, submit a resume, letter of recommendation, statement of interest, and unofficial transcript for consideration for the program. How do students participate in the FE Prep Course? Students should enroll in E 490. Are the elective tracks mandatory? The tracks are suggested listings of courses that pair well with the intended track. They are not compulsory and can be mixed and matched by students so long as the prerequisites are satisfied. How do students get credit for study abroad courses? Students should have NON-NC State courses PREAPPROVED PRIOR to the Study Abroad experience to receive credit. The requisite form is available on the NC State Study Abroad webpage and should be submitted to the Director – Undergraduate Programs for approval. What are the most common minors for ISE students? What should students do to substitute a course or take a course that is not listed in the curriculum or on the list of approved electives? Students should fill out the Course Substitution Form and submit it to the Director – Undergraduate Programs for review. The Ethics course requirement either has sections that are already filled or seats or restricted to certain majors. What are my other options? Consider taking PHI 214 – Business Ethics. The ISE department (ONLY) will accept this as a suitable replacement. Can’t find your answer? Please contact Dr. Kanton Reynolds (undergraduate) | ktreyno2@ncsu.edu | 919.515.0605 or Amy Roosje (graduate) | isegradinfo@ncsu.edu | 919.515.6410. When does preregistration advising begin and how do I get advised? Check the university registration calendar for official dates https://studentservices.ncsu.edu/calendars/. ISE holds group advising sessions beginning the week after fall break and spring break. Times and locations of the sessions are posted on monitors in the building and on details will be announced via e-mails. I have an advising hold on my account. How do I get it removed? Prepare the necessary advising paperwork as directed, Academic Advisement Form. Late advising is done at the convenience of the ISE academic advisers. I tried to register, but My Pack says I do not have a valid enrollment date. Why is this? You are trying to register before your enrollment date. Check My Pack for your enrollment day and time. What can I do if I do not meet the prerequisites for an ISE class? Prerequisites are enforced for all ISE courses, see the course catalog to review prerequisites. Any student who meets a prerequisite for an ISE course with a transfer course that has not yet appeared on his/her degree audit may contact Kanton Reynolds | ktreyno2@ncsu.edu | 919.515.2362 or Jason Low | jclow@ncsu.edu | 919.515.1424 for help with registration (must provide proof, such as an unofficial transcript. Students with special circumstances may appeal to the ISE undergraduate advisory committee. A student requesting any exception to an ISE rule or regulation must do so in writing and submit the request and a copy of the degree audit from My Pack to the ISE Director of Undergraduate Programs, Dr. Kanton Reynolds, in 441-B Daniels Hall. How can I get into a class outside of the ISE department that is restricted? When there are open seats in a course that are reserved for specific majors, you may attend class the first day and ask the instructor for permission to have one of the restricted seats. If the instructor grants permission, use a schedule revision form to add the course to your schedule. You can pick up a schedule revision form from the College of Engineering located in Page Hall. This form requires the instructor’s signature. If the course restriction says departmental approval required, you may contact the instructor to find out who in the department can grant permission (permission must come from the department teaching the class). How do I get into a full class? First, get on the wait list if you can. Note that wait lists are closed the first day of class and deleted on the last day to add a class. Attend the first day and see if there is room and the instructor is willing to take extra students into the class. For non-ISE courses, if the instructor grants permission, a schedule revision form can be used to add the course to your schedule. You can pick up a schedule revision form from the College of Engineering located in Page Hall. For ISE courses, contact the instructor. The instructor may contact Dr. Kanton Reynolds who can grant permission for you to be added to the class. It is not recommended that students contact the instructor before classes begin about getting into a full class. Can my ISE adviser help me get into non-ISE courses? No. Only administrators in the department offering a course can add or remove students from classes in that department. I have a hold on my account that is preventing me from registering. How can I get the hold removed? Advising/registration hold: Follow the ISE advising instructions. Academic warning hold: Complete an Academic Advisement Form and bring it to your adviser. Non-payment/cashier’s office hold: Late payments for tuition or student health services. Payment must be made to the University Cashier’s office before the hold can be released. Student conduct hold: Academic integrity or student conduct violation. Contact the Office of Student Conduct for more information. What are the humanity/social science (GEP) requirements for the industrial and systems engineering curriculum? All engineering students are required to take seven humanity/social science courses (21 credit hours total) from several different categories. For ISE students, you must also take an additional engineering ethics course. Humanity/social science GEP courses must be taken for a grade. The list of approved courses depends on the curriculum. Your degree audit will be the most accurate resource of approved GEP courses which are tied to your start date at NC State. What is a good minor to compliment my industrial and systems engineering major? The most popular non-humanity minors for ISE students are graphic communications, math, and statistics. Computer programming is a good minor for ISE. A minor in business administration is helpful for students who plan to get an MBA. Some ISE students minor in a foreign language. For more information about minors, visit Academic Advising Services. Fill out a Minor Declaration Form and bring it to your minor adviser, who will approve and send it to Registration & Records. The minor audit will appear under “Degree Audit” in My Pack and will be designated on your official transcript at the same time your degree is conferred. 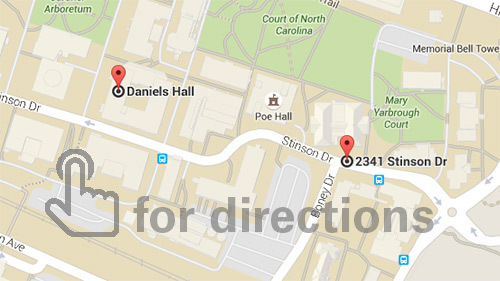 Learn about minors and their requirements including the minor advisor information here: http://advising.dasa.ncsu.edu/explore-majors-minors. Where can I find help planning out my remaining courses to make sure I graduate on time? Use your degree audit as your guide for planning courses. If you want to deviate from the suggested sequence of courses in the degree audit, be sure you will meet prerequisites for future courses. Industrial engineering course offerings are more frequent. Most 200-, 300-, and some 400-level ISE courses are offered two times a year. Take advantage of the plan of work feature in My Pack to plan out all of your courses. What are the differences between distance education and regular classes? Students are not required to come to campus for distance education courses, except for some exams. Exam accommodations can be made for students out of state. Distance education tuition varies depending on the session in which the course is taken. Check the University Cashier’s Office website for pricing: http://treasurer.ofb.ncsu.edu/cashier/. Distance education courses meet curriculum requirements the same as regular courses. Some on-campus courses are listed as “internet” courses. These ARE NOT distance education courses; they are regular courses that will be administered online. They will be billed as regular courses. Are ISE courses always offered during the summer? ISE course offerings during summers are dependent on instructor availability and student demand. If no instructor is available or demand for a course is low, it will not be offered. Can I take more than 18 credit hours in a regular semester? Yes. Students may register for up to 21 credit hours by completing a Course Load Waiver Form and having it signed by their academic adviser. I want to add/drop a course after the last day to add/drop. Can I do this? Deadlines for adding/dropping courses can be found here https://studentservices.ncsu.edu/calendars/. Late course additions must be approved by the instructor of the course and the College of Engineering. A schedule revision form should be used to add a course. Late course drops are permitted only under certain extenuating circumstances. A schedule revision form should be used to add a course. The form must be accompanied by a letter of explanation addressed to Dr. Dave Parish, Assistant Dean of Academic Affairs, justifying the request and supporting documentation (doctor’s notes, counseling center notes, etc.). Students who have a legitimate reason for dropping a course after the deadline should first consult the University Counseling Center. The university policy on late drops (withdrawals) can be found here http://policies.ncsu.edu/regulation/reg-02-05-04. Schedule revision forms can be acquired from the College of Engineering located in Page Hall. I’m an ISE grad student but I want to take MBA courses. What do I to do? The Petition to Add MBA Courses Form must be completed and submitted. I have taken or plan to take a course at another college that I intend to transfer to meet one of my industrial and engineering curriculum requirements. How can I make sure the course will transfer (This includes study abroad)? First, check the list of pre-approved transfer courses for NC Community Colleges or other colleges/universities. If the course does not appear on either list, it will have to be evaluated for equivalence. You must provide a complete syllabus, textbook list, and graded coursework (if the course has been completed already) for evaluation. These materials should be submitted to the department responsible for the course that you intend to substitute. Contact Dr. Alice Forgety: afforget@ncsu.edu or Brian Koehler (study abroad students): koehler@ncsu.edu in 120 Page Hall for help locating departmental representatives who can evaluate your transfer course. To transfer your course to NCSU, have an official copy of your transcript sent to the Undergraduate Admissions Office. Watch the video, NC State Grade Exclusion. Visit this link for information about the grade exclusion policy; http://policies.ncsu.edu/regulation/reg-02-20-16. Download the Grade Exclusion Form. Students may exclude grades (C- or lower) in up to two courses at any level. First year retakes count as exclusions. Drop the grade exclusion form off for an adviser’s signature, then take it to the Office of Registration and Records, 1000 Harris Hall. How many times can I repeat the same course? The university allows only two repeats of the same course if a grade of C- or lower is earned. Students must receive permission from Dr. Dave Parish, Assistant Dean of Academic Affairs, to take a course for the third time. Courses in which a grade of C or better is earned cannot be repeated. Which courses in the industrial engineering curriculum can be taken for credit only? E115 and PE courses can be taken for credit only. All other courses, including general education requirements, must be graded. Can I place out of a course (credit by examination)? Students are only eligible for place out exams if they have never attempted the course before at a college level. E 115 place out: Credit by Examination. University policy on credit by examination http://policies.ncsu.edu/regulation/reg-02-50-01. How can I find out whether I am suspended or on academic warning? Log into My Pack and view your Degree Audit. Click on Total Units in the top right corner of the Degree Audit. Academic standing is shown at the bottom of the Total Units page. I have been notified I am on academic warning and need to meet with my adviser. What should I do? Bring a copy of an Academic Advisement Form to your academic advisor. Be sure to fill out the top box before you come. Leave your form at the ISE undergraduate office (Daniels 410). Failure to follow these steps will result in a hold on your account that prevents registration for the next semester. I received an e-mail notifying me that I am on progress toward degree warning. What does this mean? Progress toward degree warning means you are not progressing in your degree as required by the university (e.g., taking too many non-curriculum courses, repeating courses too many times, poor grades, etc.). Students who receive a progress toward degree warning e-mail should schedule a meeting with their adviser as soon as possible [e-mail] to develop an agreement and plan of work for improvement. Students who do not show improvement after one semester or fail to meet with their adviser will be expelled from the ISE department and switched to the non-degree studies (NDS) program. The university policy on progress toward degree can be found here http://policies.ncsu.edu/regulation/reg-02-05-03. Can’t find your answer? Please contact Dr. Kanton Reynolds (undergraduate) | ktreyno2@ncsu.edu | 919.515.2362 or Yahya Fathi (graduate) | fathi@ncsu.edu | 919.515.6417. What is the difference between a co-op and an internship, and when is the best time to apply for one? A co-op is a structured, university approved work program designed to allow students to alternate semesters of school and paid work in their field of study. During semesters of work, students enroll in a zero credit co-op class (COP ***) that allows them to maintain continuous enrollment. Co-op generally requires one extra year in school to complete the program, and the time spent working can be applied toward a professional engineering license. For more information about co-op, visit the co-op website. Students should apply for the co-op program after they have matriculated. An internship is a short-term job in the student’s field of study. Students normally apply for internships on their own, just like a regular job. Most students who choose to intern do so during the summer. Since there is no internship program offered through the university, a student who interns during a regular semester is considered withdrawn from school and must reapply to return the next semester. This can be avoided by taking at least one course from NC State while interning, on-campus or via distance education (non-ISE courses only). Internships CANNOT be applied toward a professional engineering license. Students may intern any time. Can I receive course credit for an internship or engineering-related job? Course credit cannot be awarded for paid internships or jobs. Apply for graduation at the beginning of the semester or summer session in which you are completing the last courses you need to complete your curriculum requirements. Fill out a graduation form, which will be provided by the ISE Undergraduate Office. When the necessary forms have been submitted, you will receive e-mail communications from the university and department about graduation-related details. Where and when are the departmental and university graduation ceremonies? Information about the university graduation ceremony can be found here https://studentservices.ncsu.edu/your-degree/graduation/. For information about the ISE graduation ceremony please contact the ISE undergraduate office. Is there a course that will help me prepare for the fundamental of engineering (FE) exam, and is the class required to take the exam? The FE preparation course is E490. E490 is not required to take the FE exam. More information about the FE exam can be found here: https://www.engr.ncsu.edu/academics/undergrad/profengr/. How do I apply for scholarships, and what are my odds of receiving one? Students should visit the College of Engineering scholarship web page to apply for all COE and ISE scholarships. ISE and COE scholarships are awarded only to matriculated students. About 15% of ISE students received some type of COE or ISE scholarship. Odds of receiving a scholarship vary by year. GPA (overall and major), financial need, personal statement, and classification are strongly weighted in the awarding process. Availability of funds determines the number and amount of new scholarships awarded each year. I am interested in doing undergraduate research. How do I get started? If you are doing well in your classes and have time for outside activities, then undergraduate research may be for you. It is an excellent experience that prepares you for higher education. The best way to get started is to look through the faculty profile pages and the ISE research pages. Then, select faculty who work on research topics of interest to you, and meet with them to discuss their undergraduate research opportunities. Opportunities may also be announced in the weekly ISE e-mail blast. I am interested in applying for graduate school in the ISE department. How can I find out more information? See the ISE Graduate Admissions page. I need to reserve a classroom for a student organization-related event. Whom do I contact about this? Please submit the request at least two days in advance of the event.